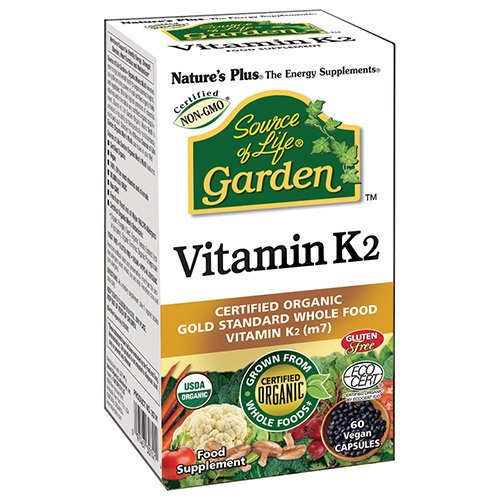 Source of Life Garden Vitamin K2 is the first vitamin K2 supplement made to exacting organic standards. Each easy-to-swallow capsule provides 120 mcg of vitamin K2, the most bioavailable form of this bone-health nutrient. The main function of Vitamin K2 is to initiate the calcium-binding properties within properties, and it has a number of potential health benefits. Vitamin K2 can help move calcium into vital areas of your body – particularly for bones and teeth support. Vitamin K (as K2, menaquinone-7), Certified Organic Whole Food Blend (Acerola Extract§, Flax Seed§, Broccoli Sprout§, Cauliflower Sprout§, Cordyceps Mushroom Mycelia§ (Cordyceps sinensis), Kale Sprout§, Maitake Mushroom Mycelia§ (Grifola frondosa), Ginger Root§, Parsley§, Pure Beet Juice§, Pure Carrot Juice§, Pure Spirulina§, Cinnamon§, Shiitake Mushroom Mycelia§ (Lentinula edodes), Spinach§, Tomato Juice§, Wild Bilberry§, Wild Blueberry§, Pure Chlorella§),Bulking Agent (Rice Maltodextrin§), Capsule§ [Pullulan Polysaccharides (from Aureobasidium pullulans), Carrageenan, Purified Water], Rice Protein§. As a food supplement for adults, take 1 vegicap daily. If you are taking anticoagulants (blood thinners), do not take this product except on the advice of a doctor. 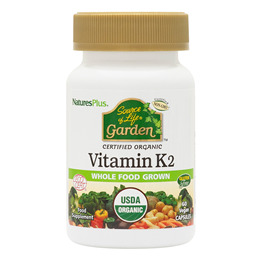 Below are reviews of Source of Life Garden Vitamin K2 - 60 Vegicaps by bodykind customers. If you have tried this product we'd love to hear what you think so please leave a review. High quality product, I purchased it several times, highly recommended. The best k2 you can buy, believe in it! It works !